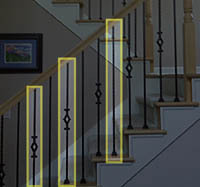 A baluster is a vertical post in a series that supports the handrail or banister in a staircase. 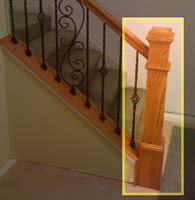 Balusters can be made of wood, stone, or metal. They are sometimes called spindles or guards. More recently, balusters have become a form of decoration, adding elegance and warmth to any room. 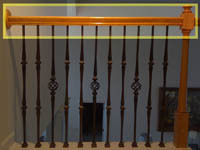 A narrower support to a handrail than a traditional baluster; banister is also used to refer to the handrail of a stairway. 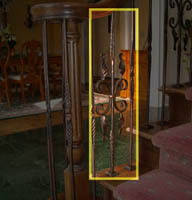 A basket baluster often refers to the series Basket and Twist which incorporates bold twists with decorative baskets. It is one of the most popular designs and can be used in a variety of ways. Basket designs come in single and double balusters and can be varied intermittently with other designs according to preference. 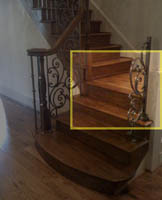 Also called banister, a handrail is grasped to provide support and balance when ascending or descending a staircase. 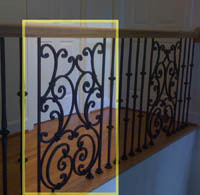 Handrails are typically supported by posts or mounted directly to walls. A type of intricately designed decorative baluster associated with the Tuscan, Contemporary, and Mediterranean styles. 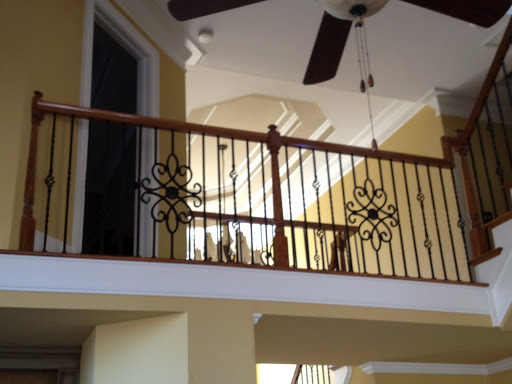 This design can vary in complexity from a medallion with vertical iron balusters on either side to a more continuous heavy design. Knuckle refers to a type of baluster with a knobbed pattern. This single or double iron baluster is versatile, coming in many shapes and sizes including: spoon-knuckle, round knuckle, or hammer knuckle. 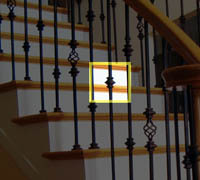 A landing area is an area near the bottom or top of the stairs. 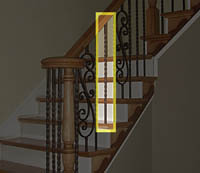 An intermediate landing is an area of rest in the middle of a staircase. This intermediate platform or landing area allows the stairs to change directions. It also provides an element of privacy so guests on the bottom floor cannot simply look up the stairs to see onto the next level. 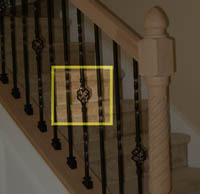 A medallion is a decorative center piece, usually installed with iron balusters, and generally in balcony areas. Medallions can be varying in widths and designs. 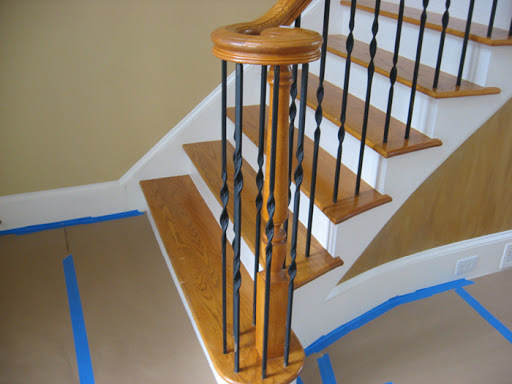 A newel is a larger baluster that is used to anchor the handrail. In a straight staircase, this usually refers to the principal post at the foot of a staircase. 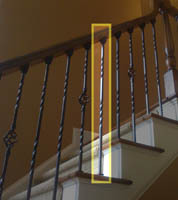 A half-newel may be used when a railing ends directly into the wall. Visually, it looks like the other half of the newel is embedded in the wall. The ribbon baluster series mimics the appearance of a slightly twisted ribbon. This popular design is regularly used intermittently between scroll designs, iron panels, and medallions. Often called a feathered scroll, this baluster design can be elegant or completely curvy. Many popular Italian scroll styles offer a curve design as opposed to feathered, but there are many scroll options including heart, butterfly, and leaf. Custom scroll designs are also available. This distinctive baluster pattern represents perfectly proportioned globes that fan out similar to the shape of a spoon. The tasteful spoon design has a handcrafted appeal and creates a thicker “fleshy” appearance. 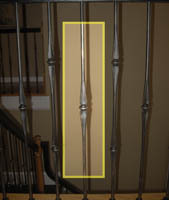 A twist baluster design refers to any baluster that has a twisted pattern. Examples of this include the Basket & Twist Series, the Ribbon Series, or custom work involving a twisted baluster.